(CNN) -- Australia's navy Monday opened two weeks of hearings into the World War II sinking of the cruiser Sydney II, an effort to formally close the book on the country's worst naval disaster. 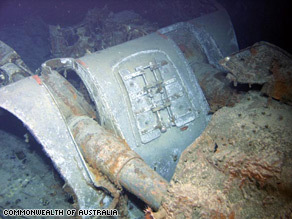 The gun turret of Sydney II was discovered with the rest of the vessel in March 2008. The ship's entire crew of 645 died when it was sunk by the German commerce raider Kormoran. About 15 relatives of the lost men attended Monday's opening session, said Cmdr. Jack Rush, the lawyer presenting the evidence gathered by investigators to a commission of inquiry led by a retired judge. "I don't think until today -- until you actually get to hear the evidence of the impact of a bombardment of the ship and the nature of the injuries -- I think there are some pretty mixed emotions as a consequence of it," Rush said. The inquiry could produce its report on the sinking by April, he said. In March, researchers discovered the Sydney's wreckage in the Indian Ocean, about 207 km (128 miles) off Australia's west coast. At the time it sank, searchers found only two floatation belts and an empty life raft -- and the only accounts of its November 1941 destruction came from survivors of the Kormoran, an armed cargo ship flying a false flag. The German ship inflicted "enormous damage" on the Sydney during a battle that is believed to have lasted about 35 minutes and left 70 percent of its crew dead or incapacitated, Rush said. "It is likely that the captain, the navigator, all the senior officers were taken out on the first salvo," he said. A torpedo tore into the Sydney's bow, flooding the forward end of the ship, while the Kormoran fired an estimated 87 rounds from its 15-cm (5.9-inch) guns into the Australian cruiser. The Sydney limped away and sank sometime between two to four and a half hours later, Rush said. During the battle, however, the Kormoran was hit by an Australian shell that damaged its engines and set the vessel ablaze. With hundreds of mines aboard, its captain ordered the crew to abandon ship, fearing the fire would set those off. A search began only five days after the battle, when the Sydney had failed to return to port in Fremantle. And an 11-day delay by Australia's government in announcing the ship's loss fueled what a 1999 parliamentary report called "a proliferation of theories" about the fate of the crew -- that the ship was actually sunk by a Japanese submarine, that survivors were machine-gunned in the water or that the government hid bodies after they washed up on the beach. Rush said some of the proponents of those theories will be allowed to present their cases to the inquiry as well. "We're not hearing from everyone, but we are giving an opportunity to people to make those arguments," he said.